Companies are starting to look for influences on social media and the web. While there are several platforms trying to measure influence, the accuracy of their results is questionable, at best. Some of the most popular tools and sites to measure influence are Klout and Kred, among a few others. While Klout is quite popular around social media users, and companies looking for influences, its ability to measure real influence is limping. In times when it is possible to increase the Klout score with posting “cat pictures”, it appears Klout measures usage more than any relevant influence and seems to be far away from delivering a relevant influence score. However, companies have discovered that real influences can be of value for marketing purposes. Many have started digging for such influences and go beyond the scores of any measuring tool and check for relevant content and reach beyond “just posts” on Twitter and Facebook. Earlier this year, Ar Company and Sensei Marketing surveyed marketing professionals around the world in the ongoing effort to better understand this growing industry and where businesses stand on the issue of influence marketing solutions. Can social influence truly be measured? – Is anyone using them? – What’s the future of influence marketing? We’ve created the following infographic to highlight some of the key findings. 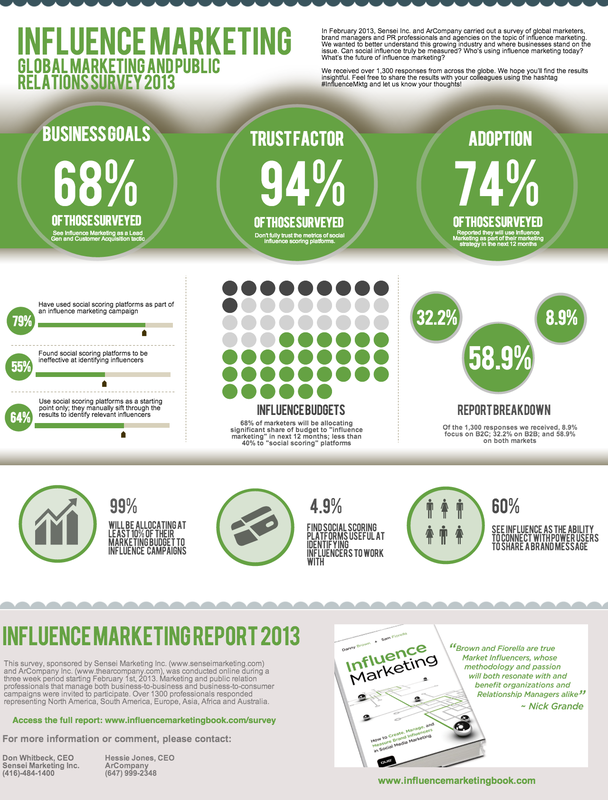 This entry was posted in Infographic, Internet Marketing and tagged Influence Marketing, Influence Marketing Infographic, Internet Marketing, online marketing, Online Marketing Infographic. Bookmark the permalink.